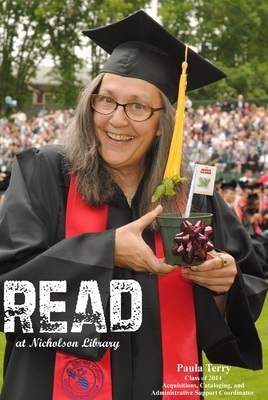 Paula Terry, Acquisitions, Cataloging, and Administrative Support Coordinator, class of 2014, reading The Magic Acorn, illustrated by Allan Rae. Terry, Paula and Nicholson Library Staff, "Paula Terry READ Poster" (2014). READ Poster Gallery. Image. Submission 140.